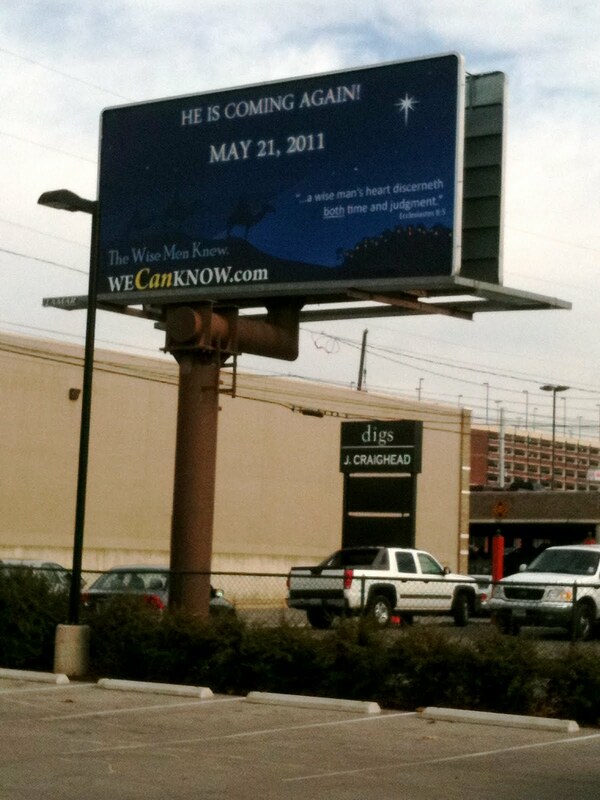 I spied this billboard in Nashville’s upscale Green Hills shopping area. Ironically, it’s half a block from this billboard which caused such an outrage last year. There is a time-honored tradition of predicting Jesus’ return. Since they’ve all been spectacular, embarrassing fails, most of these apocalyptic nutters have stepped away from endorsing a specific date in recent years. So I give the folks at Family Radio Inc. props for putting their butts on the line. That doesn’t mean I don’t also reserve the right to point fingers and laugh when the sun inevitably rises on May 22, however. Mr. Beale loves to tell the story about the prank some Southern Baptist church staffers played on their church secretary the last time a notable Rapture date was in the news. When the poor woman was due back from lunch, everyone in the church office draped clothing and shoes at their workspace, then hid. I doubt she actually thought everyone in the church office had been raptured when she returned from lunch, but everyone did get a good laugh. See, even church people can have fun with this stuff. The Rapture is just one of many things that are not in the Bible. It is a 19th century myth peddled by a bunch of hucksters and charlatans. Which is too bad, because sometimes I think the world would be better off if they’d go along their merry way, already. >haters to denounce him as a Commie and waterboard his @ss.kinda like the first time, then.